Monkey Business is a 1952 American screwball comedy film directed by Howard Hawks, written by Ben Hecht, and starring Cary Grant, Ginger Rogers, Charles Coburn, and Marilyn Monroe. To avoid confusion with the 1931 Marx Brothers film of the same name, this film is sometimes referred to as Howard Hawks' Monkey Business. Dr. Barnaby Fulton (Cary Grant), an absent-minded research chemist for the Oxly chemical company, is trying to develop an elixir of youth. He is urged on by his commercially minded boss, Oliver Oxly (Charles Coburn). One of Dr. Fulton's chimpanzees, Esther, gets loose in the laboratory, mixes a beaker of chemicals, and pours the mix into the water cooler. The chemicals have the rejuvenating effect Fulton is seeking. Unaware of Esther's antics, Fulton tests his latest experimental concoction on himself and washes it down with water from the cooler. He soon begins to act like a 20-year-old and spends the day out on the town with his boss's secretary, Lois Laurel (Marilyn Monroe). When Fulton's wife, Edwina (Ginger Rogers), learns that the elixir "works", she drinks some along with water from the cooler and turns into a prank-pulling schoolgirl. Edwina makes an impetuous phone call to her old flame, the family lawyer, Hank Entwhistle (Hugh Marlowe). Her mother, who knows nothing of the elixir, believes that Edwina is truly unhappy in her marriage and wants a divorce. Barnaby takes more elixir and befriends a group of kids playing as make-believe Indians. They capture and "scalp" Hank (giving him a Mohawk hairstyle). Meanwhile, Edwina lies down to sleep off the formula. When she awakens, a naked baby is next to her and Barnaby's clothes are nearby. She presumes he has taken too much formula and regressed to a baby. She takes the child to Oxly to resolve the problem. Meanwhile, more and more scientists (and Mr Oxly) at the laboratory are drinking the water and reverting to a second childhood. The formula is lost with the last of the water poured away. The parting adage is "you're old only when you forget you're young." Review aggregation website Rotten Tomatoes gives the film an approval rating of 88% based on 25 reviews and an average score of 6.9/10. Hawks said he did not think the film's premise was believable, and as a result thought the film was not as funny as it could have been. Peter Bogdanovich has noted that the scenes with Cary Grant and Marilyn Monroe work especially well and laments that Monroe was not the leading lady instead of Ginger Rogers. However, Gregory Lamb of The Christian Science Monitor described Rogers as "a comedienne par excellence" in the film. ^ "Monkey Business (1952)". Rotten Tomatoes. Retrieved June 24, 2017. 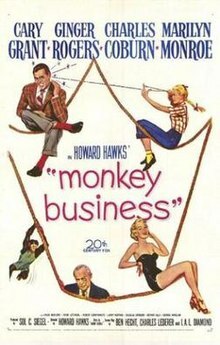 Wikimedia Commons has media related to Monkey Business (1952 film). This page was last edited on 2 February 2019, at 07:16 (UTC).